How the 2016 Koop Award Raises Lying to an Art Form « They Said What? If you were at the HERO conference, you witnessed a surreal experience. 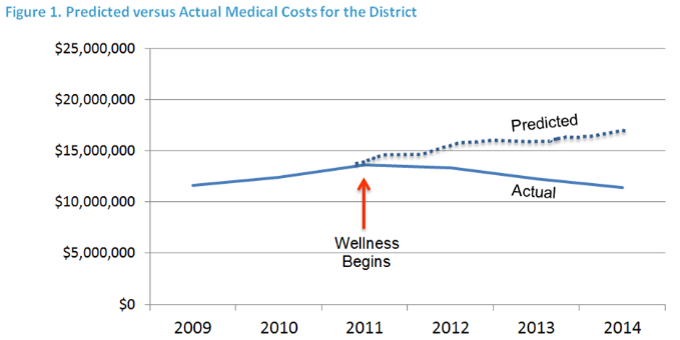 Executives from Johns Hopkins, Mercer, United Healthcare and elsewhere willing to risk their jobs by perpetuating what has now been exposed as a bald-faced, presidential candidate-level lie: that Wellsteps deserves an award for a program allegedly benefiting Boise teachers so dramatically that costs fell by a third. They will not mention the article in STATNews that came out yesterday showing that school district employee health deteriorated. You read the article, so you know they are lying. And they know you know they are lying. And yet the whole thing just continues as though it is somehow all OK because no one is admitting it publicly. Here is some more detail on the lies in question. Sharon Begley’s article Wellness Award Goes to Workplace Where Many Health Indicators Got Worse does not lose anything in the re-reading. Quite the contrary, almost every quote in it is either a lie, or exposes the Wellsteps application as a lie. In each case, Wellsteps’ Steve Aldana, Johns Hopkins’ Ron Goetzel, United Health Care’s Seth Serxner, and all the other committee members know it’s a lie, because of the aforementioned article. “Lie” might seem like a harsh term, but the alternative is to assume that Ron and his cronies have absolutely no idea how to read an outcomes report, even though I have already showed them how to read this report in particular. True, one could argue that Ron has been known to use the “dumb and dumber defense” when giving his friends their awards, but in this case he can’t pretend he doesn’t know any better because he was quoted in the article. Another argument that these are lies: no one — not even a member of the Koop Committee — can possibly be this stupid accidentally. Let’s go lie by lie. Let’s start with the last quote from Ron “the Pretzel” Goetzel, because it sets the stage for the others. He got his moniker because he has a way of twisting and turning words to make himself sound like he isn’t lying. In this case, he said if “an application said everything went exactly right,” it would certainly “raise eyebrows” on the Committee. “Went exactly right”??? Ron, isn’t the entire point of wellness to make employees healthier? So if a program makes employees unhealthier, we say it didn’t go “exactly right”? Using this definition, here are a few other things that did not “go exactly right”: New Coke, Yugos, the 1962 Mets, Vietnam, subprime loans, Yahoo, and the 2016 presidential nominating process. And for that matter, Begley’s article points out that McKesson’s 2015 award also wasn’t “exactly right,” in that the program didn’t do anything and the data self-contradicted. It’s not just McKesson. I have been tracking these Koop Award-winners for years, and they all self-invalidate. Each is more hilariously not “exactly right” than the other. Yessirree, if there is one thing that shouldn’t keep Koop Committee members up at night, it’s the fear that one of their award applications might be exactly right. So the good news is that no Committee member has to worry about contracting an acute case of over-raised eyebrows. Another lie exposed: It turns out the Koop Estate licenses the name to this cabal in order to make money, just like Dr. Koop licensed his name to make videotapes. The award is now admitted to be “industry sponsored.” This is the first time this provenance has been disclosed in print. It is basically a marketing scheme for the committee members and sponsors. They had claimed to be a “private-public” organization. That Orwellian Pretzel-speak is a lot different from being admittedly industry sponsored. Next, Dr. James Fries — whose major wellness expert credential is writing an article finding massive population-wide savings against a phony control group by getting a few diabetics to eat less fat — called this “an exemplary program” that “showed improvements in health behavior” leading to cost reduction. Yes, a few self-reported behaviors improved. We suspect the Boise teachers lied, because they clearly lied when they self-reported their smoking (only 2.5% admitted it) and drinking (only 20%). But let’s assume they didn’t lie–meaning somehow they are different from everyone else when they complete workplace health assessments. 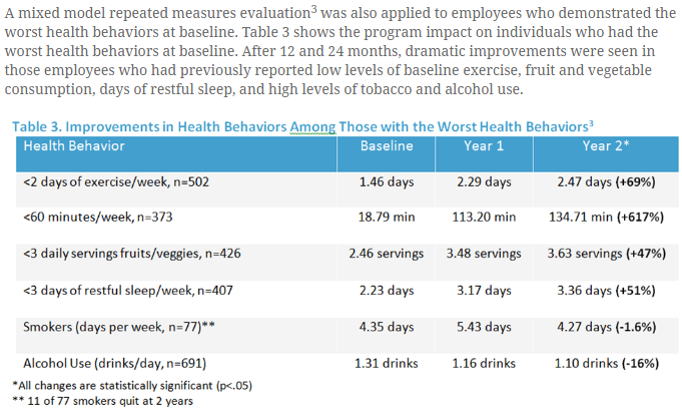 Exercising three more minutes a day and eating 0.11 more fruits and vegetables/day cannot reduce health care costs at all, let alone by a third, especially when the employees became unhealthier overall. This statement would therefore qualify as a mistake, assuming Dr. Fries is not bright enough to already realize it is wrong. If Dr Fries doesn’t retract it now that he knows it’s wrong, it becomes a lie. He also contributed my favorite line of the article: even “one more bite of a banana” can make a difference in people’s health. This is true, of course, for the segment of the population that is starving to death. Otherwise, how dumb is this claim? Let’s just say that if a college taught him this, it could lose its accreditation. And that brings us to his biggest lie of all: He says I didn’t understand the program benefits because I didn’t read the data. I did, of course. I even actually added up the datapoints, which no one on the Koop Committee did. I’ll give Committee members the benefit of the doubt and assume they failed to add the datapoints not because they didn’t want to expose the truth that Boise employees got worse in their friend’s program, but because calculators are not yet available in their cave. And yet when it comes to giving his friends awards, failed programs harming employees but generating massive phony ROIs don’t seem to bother him at all. Let’s see him Pretzel his way out of this one. One thing vendors love to do is play blame-the-victim. The Pretzel pioneered this approach by saying he had “absolutely nothing to do with Penn State,” when in fact he was in the room when they defended their program to the media. Seth Serxner stood up, on camera, and basically declared United Health Care/Optum hates it when employees spend too much money on their screening programs, and typically begs to do less. United Healthcare complained that I was making them look bad, but then couldn’t produce a single name of a single employer who would admit to deciding to spend more money for the express purpose of screening inappropriately. And now here comes Steve Aldana, blaming the Boise school administrators for insisting on throwing taxpayer money away and harming their employees, by flouting US Preventive Services Task Force guidelines. My suspicion is that their Boise customers have an alternative view, but — despite the presumably obvious pride they must be taking in this award — they are refusing to comment on it. One can only imagine the conversations taking place in Boise right now…and this is before the Idaho Statesman gets hold of this debacle. the application process, including the requirement that wellness programs submit statistics and rigorous data analysis, has become so strict that fewer programs want to go through the process. However, if you actually look at the application form, it is exactly the same now as it has been every year this century. And indeed the data submitted, if anything, was more comprehensive then. For instance, the 2000 winner, Fannie Mae, clearly documented all the prostate, pulmonary function and other USPSTF D-rated tests they forced employees to submit to. By whynobodybelievesthenumbers in HERO, Koop Award Invalidity, Uncategorized on September 28, 2016 . Can I come to your and Ron’s next holiday bromance party? I particularly enjoyed the banana quote too. Regarding your intro and describing the experience as surreal, I think that too is related to the presidential campaign. It may seem surreal to some of us still, but lying just doesn’t seem to concern many people anymore. If there was one place where the wellness industry has been ahead of the curve, it was when they were a first-mover into the post-factual world.